I spent some time stomping around my hometown with Jellybean visiting Papa and Grandma last weekend. It was a crisp 40 degrees Fahrenheit but that didn’t stop Jellybean from convincing Papa to play at the park. I played chauffeur. I wisely chose to sit in the mini van with podcasts (and heat) while Papa chased Jellybean. I had my Vacation Vanilla Socks tucked into my backpack and when I examined them I realized I was ready to start the heel! 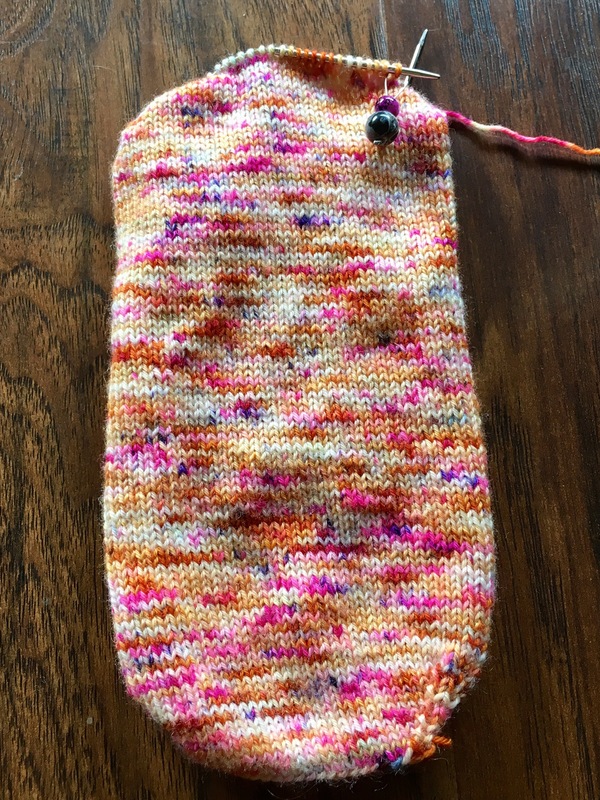 I improvised some fancy stitch markers from scraps of yarn scavenged from the bottom of my knitting bag and off I went with a standard toe up gusset heel. My birthday came and went in a flurry of laundry and stomach flu woes. We have had some unseasonable weather her in the Midwest and it’s really reeking havoc on our immune systems….at least in this house. 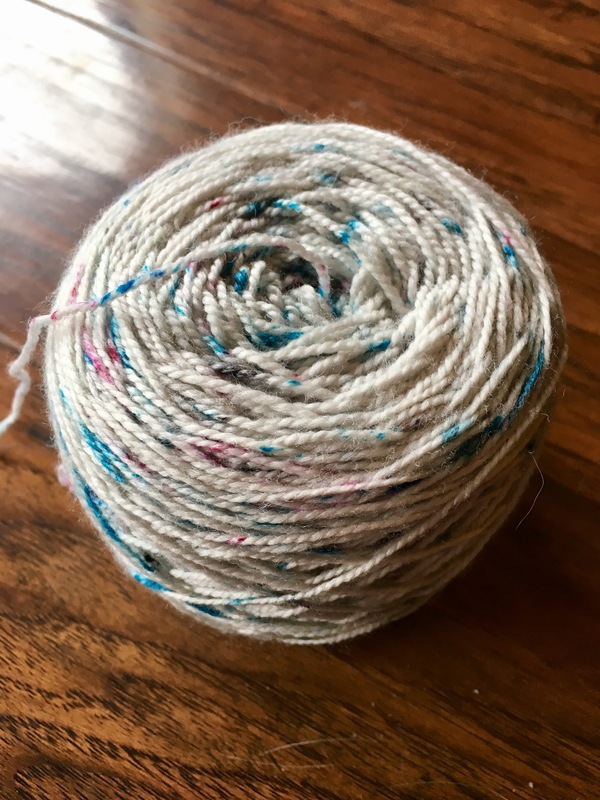 Nonetheless, my husband asked for some birthday suggestions and I sent him some names of new-to-me yarn dyers that I would like to have something from. He picked Shannon of Mudpunch. She’s Canadian and I hear her mentioned on several Canadian podcasts I listen to. The hubby chose a speckle sock set in her Tundra/Desert colorway. The yarn has a great hand and the lovely green colors are something I wouldn’t normally choose. I can decide if this needs to be a two color shawl or a pair of socks with contrasting heels/toes/cuffs. I’ve never done the later (on purpose anyway) and the former is still relatively new to me. I think this yarn needs to ruminate in the stash for awhile! Happy Knitting!! During my tomato madness last weekend I decided to pull a project from my Pigskin Party KAL prep. 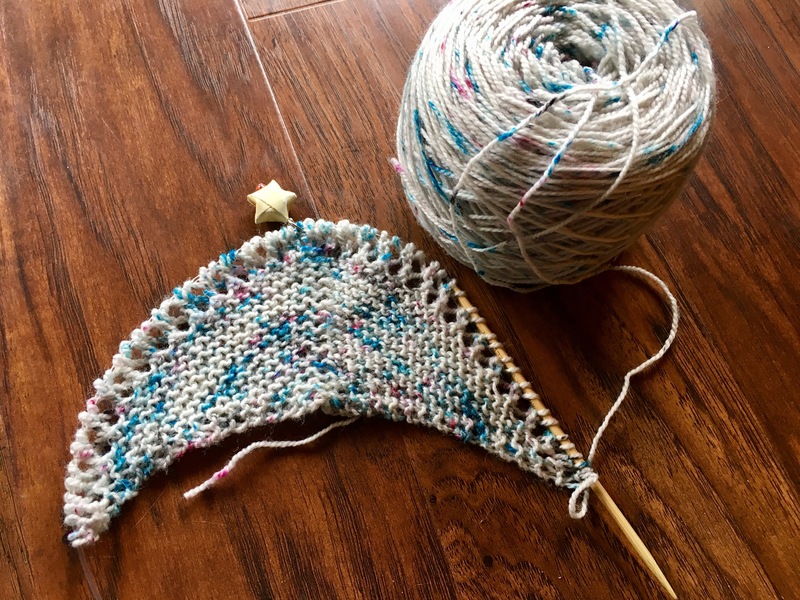 I cast on for the Reyna Shawl by Noora Laivola. I had some beautiful speckled Hawthorn Speckle Handpaint in the Cosmic Speckle in my stash. 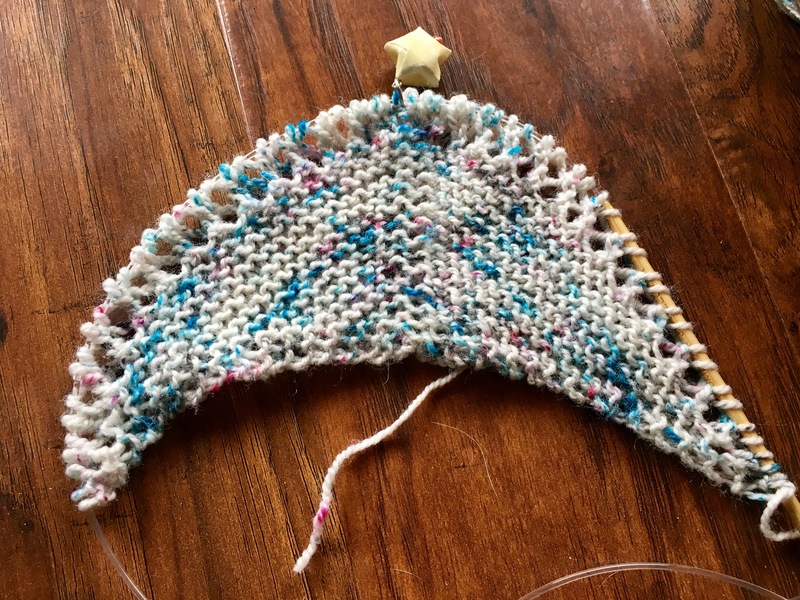 This yarn told me it needed to be something squishy in garter stitch. I’m loving how the pops of color are popping up! This pattern is just so amazing. It’s a free pattern and has been knit over 5,000 times. I’m probably the last person on Ravelry to stumble on this one, lol. The pattern fits on one page, it’s well written, and you guys it has a row tracker check box thingy! With as much as I have to pick up and put down my knitting this is a life saver! I completed the cast on, one garter section and one lace section in one sitting. I can quickly feel this project becoming addicting!! This yarn is just so yummy I can’t wait to see the finished product. I was thinking this was going to go into the gift box…but I may not be able to part with it! !